In as thorough a beating as this March’s NCAA Tournament has seen to date, Clemson moved on to the Sweet 16 in the Midwest, in large part, by stymying Auburn’s offense at an alarming rate. 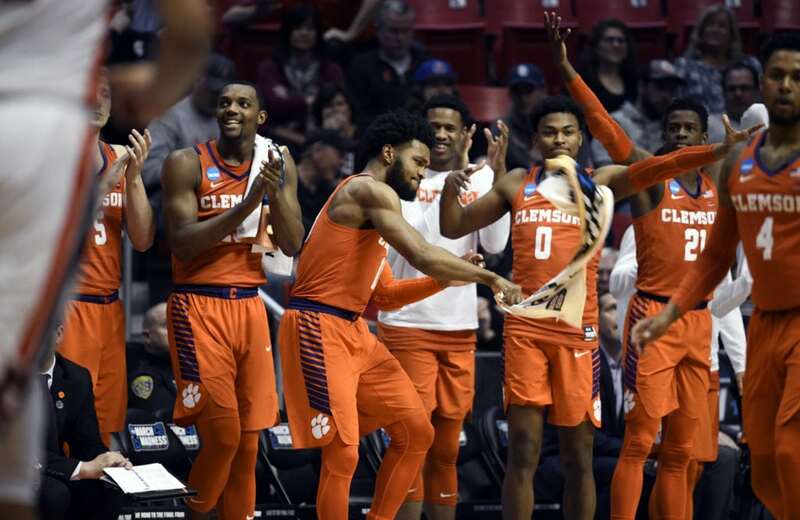 The ACC’s Tigers advanced to a regional semifinal versus Kansas with a 31-point victory on Sunday in San Diego over the SEC’s regular-season co-champion. During the drubbing, Clemson (25-9) limited Auburn to 19 first-half points and 25.8-percent shooting for the game. Auburn only scored on 22 of 70 possessions against Clemson, which enters Friday’s meeting with Kansas in Omaha, Neb. (6:07 p.m. CBS), ranked 18th nationally in field-goal percentage defense (40.4 percent). The question for eighth-year Clemson coach Brad Brownell is what his team’s stingy defensive numbers against Auburn will mean for the players moving forward. What’s more, Brownell, who also coached Wright State and UNC-Wilmington to NCAA Tournament appearances in the early 2000’s, hopes senior guards Gabe DeVoe and Shelton Mitchell, junior guard Marquise Reed, junior forward Elijah Thomas, freshman forward Aamir Simms and their teammates now feel used to the big stage with their 2-0 start to the postseason — a 79-68 win over New Mexico State and the 84-53 annihilation of Auburn. Though this is the first trip to the Sweet 16 for Brownell as a head coach, he expects to feel right at home in terms of the company he will keep on the sidelines. So far this season, Clemson has held its opponents to 43.8-percent shooting on 2-pointers (eighth nationally), but allowed 34.9-percent shooting on opponents’ 3-pointers (181st). Kansas ranks 16th in the country in 2-point field-goal percentage (54.1 percent), and enters its matchup with Clemson shooting 40.3 percent from 3-point range (11th nationally).